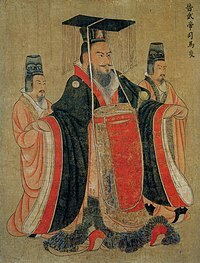 Emperor Wu of Jìn (Chinese: 晉武帝 236 - 290) was the founder of Western Jin Dynasty. His name was Sima Yan. He was born in He Nei (now Henan Province). His father was Sima Zhao and Sima Yi was his grandfather. They were the imperial officials of Wei Dynasty and seized control over the imperial court. In 265 AD, Sima Yan forced Emperor Cao Huan to abdicate. In 280 AD, he conquered Eastern Wu and unified China. This page was last changed on 17 January 2017, at 19:16.